1) For Sale - Bauer I-180-E3 Horizontal Compressor, 5000 PSI, 22 CFM 20 HP, 4 Stage, 230-480v 3 Phase, three new 31" purification towers, no Securus, has gauge panel and automatic moisture drains, has 1987 hours on hour meter. Pump and chassis is in good condition with stage gauges reading per factory specs. 90 day 50/50 parts warranty upon return of old parts. 750 Lbs 58"Lx35"Wx44"H. Retails approximately $23,500. Sale price $11,750. Stock photo below. Used HP breathing air compressors, used HP compressors, used air compressors, used industrial air compressors and used SCUBA compressors are available from American Airworks. We receive used air compressors, mostly from fire departments, that have upgraded to newer larger units. Historically fire departments use their compressors very little and see regular preventative maintenance. Our used high pressure compressor inventory consists of Bauer compressors, Mako compressors, Eagle compressors, Scott compressors and occassionally Airworks compressors. Rental air compressors available. We lease high pressure industrial air compressors or breathing air compressors for human consumption and other uses. We offer 5000 PSI leased compressors, with various flow rates of 9 to 100 CFM output. Our rental compressors are powered by electric or diesel motors. Our leased air compressors meet the urgent need for air while your unit is repaired or for the purchase of a replacement new compressor. We buy used fire department compressors at times. Email us your department's compressor low resolution pictures, hours on unit, electrical specifications and compressor specifications, usually, found on a metal plate on the chassis. 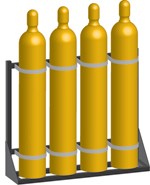 We sell new and used ISO air cascade cylinders ....see below! Get a used compressor quote, email us! 3) For Sale - 1989 Bauer K20D, (very similar to above chassis) 5000 PSI 22 CFM, 25 HP Lister Peder Diesel motor, two purification towers, Bauer auto drain system, new stage and oil pressure gauges, new battery, 11 hours on hour meter, horizontal open chassis ihas some surface rusting, unit is in fair cosmetic condition but both the diesel motor starts easily and compressor runs well with compressor stage gauges reading where Bauer manual indicates they should be. Flow rate is 22 CFM output too. Would be a great unit for mobile trailer or the islands where no electricity exists. 90 day 50/50 parts warranty. New retail $58,000, good buy at just $14,500. Photos available if interested as are a couple of videos of unit running. Email us or call for information on this unit. 6) For Sale or Lease - Ingersoll-Rand 6R/51 Air Compressor, 4 Stage, 6000 PSI, 55 CFM FAD, 50HP 230-480v 60Hz 3 Phase, air purification included with this unit, has gauge panel and automatic moisture drains, 2200 Lbs, 85x37x52", New unit retails for $79,000, Sale price $58,000 Actual photos of compressor below. 7) For Sale or Lease - Ingersoll-Rand 6R/100 Air Compressor, Remanufactured, 4 Stage, 6000 PSI, 100 CFM FAD, Detroit 453 diesel motor 175 HP, spark arrestor, air purification included with this unit, has gauge panel and Mark 4 Automatic moisture drains, 5500 Lbs, 96x48x65", off shore drip pan, New unit retails for $179,000, Sale price $89,000 Actual photos of compressor below. We run all our used compressors for 2-4+ hours and do cubic feet air flow tests prior to shipping. We make repairs needed for proper compressor operation. Cylinder valves are inspected and replaced when needed, purifications towers are internally and externally inspected for pitting and cracks, oil is changed with fresh food grade high temperature synthetic oil and new replacement purification filters are installed. We strive not to have follow up repairs after unit delivery. 8) For Sale - Sierra Model 9000 A2, dual pressure selectable auto stop pressures of either 2216 or 4500 PSI with 84 hours on meter. New cost $8715. Sale price $4685, a 47% discount. 180 day warranty at Airworks. Sierra boosters make a nice addition to your air cascade system, either stationary or mobile with a generator. Use the air from your storage cylinders that's below your fill pressure either on the scene, at the fire station, dive shop or paintball field. Click here to go to our Sierra booster page. We sell new 2250, 2400, 3000, 3600, 4500, 5000 & 6000 DOT/ISO/UN air storage cylinders, insert, oxygen and hydrogen gases as well. We are one of largest breathing air cylinder distributors in the U.S.A. Our volume means you get a better discount when buying cylinders. For a price quote on new cylinders call us 800-523-7222 or send us an email here. 1) 17 used , DOT 4500 PSI, 444 CF lightweight Taylor Wharton steel cylinder, with 5 year retest cycle with two or three years remaining on current hydro-test, with CGA 347 air valve & shipping cap. 155 Lbs empty, with a few scratches to Yellow paint, $325. 2) New ISO/UN/DOT 4500 PSI, 437 CF lightweight steel cylinder, 10 year retest cycle, with CGA 347 breathing air valve, 160 Lbs empty. In stock now & ready to ship. Call for price quote. 3) New ISO/UN/DOT 5000 PSI, 454 CF lightweight steel cylinder, 10 year retest cycle, with CGA 347 breathing air valve, 210 Lbs empty. In stock now & ready to ship. Call for price quote. 4) New ISO/UN/DOT 6000 PSI, 510 CF steel cylinders w/702 breathing air valve and shipping cap, 10 year retest cycle, 210 Lbs empty. In stock now & ready to ship. Call for price quote. We sell breathing air tees, pigtails, fittings, CGA & DIN connections and 6000 PSI custom lengths of flexible hose too. 11 Gal Water Volume - 3 Ports, top, bottom and shoulder- 400 Lbs 10" OD x 55" L - Install horizontal or vertical - Stock photo below. ASME racks available too. New and used large quantity of various ASME vessels, 300-7000 PSI working pressure, 11 - 3750 Gallon water volume each vessels. Vessels are sold "As Is" and refurbished, ready to connect to. Most vessels are National Board certified with certs available. We also have tube trailers and MEGC skids. 800-523-7222 or email us for our up to date inventory list & pricing. Stock photos below. Airworks is looking for dealers to represent our Fast Series compressor line, containment fill stations and our air cascade systems into fire service, institutional, paintball, SCUBA and into industrial markets. We offer new 3.5, 6.0, 9.0, 14.0, and 18.0 CFM units with pressures of 5000 and 6000 PSI. Contact us to discuss this opportunity. Email us or call 800-523-7222.